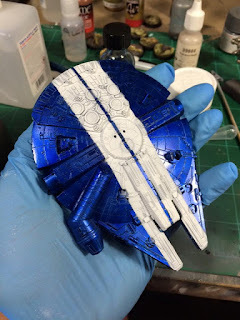 I commissioned to paint a Millennium Falcon for X-Wing Miniatures in Shelby GT500 Mustang livery for a client that I had previously done a handful of B-wings for. I used Alclad Candy Blue on top of their Bright Silver Base and the stripes are Tamiya Flat White (XF-2). The engine grilles and windows will be painted black. I'm not sure what I will do with the sensor dish, but it will have the Shelby Cobra logo on the inside.